"Everyone my age pees their pants, it's the coolest!" This dad showed his daughter there's actually no shame in those little accidents. Ben Sowards is officially dad-of-the-year after he "peed himself" so his daughter Valerie won't be so embarrassed about her own accident. Ben told Buzzfeed News that his wife had called him one afternoon to tell him that their daughter Valrie had had an accident at school, was crying and wanted to go home. "My heart kind of just broke, so, I splashed some water on myself and left to pick up Valerie." 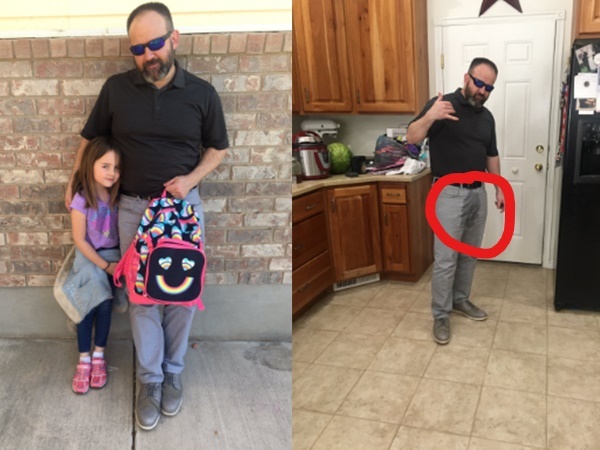 The dad drove to his daughter's school with sodden pants, pretending to have had an accident of his own. When he arrived at her school he walked into the classroom and asked his daughter for her school bag to cover his wet patch. This stunt seemed to have worked wonders, as his daughter was all smiles after the sweet gesture. "She was laughing about it," he said. "It was so funny." Valerie's older sister Lucinda took pictures of the "wet patch" pair and shared them on Twitter - and her followers couldn't get enough.